With a tagline of Happiness Must Be Earned, the 101 Action Movies brings us this Douglas Fairbanks silent classic from 1924. 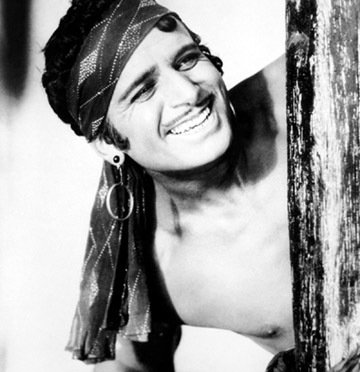 Fairbanks, how is quite happy to eschew as many clothes as he can, cavorting about like Captain Kirk’s predecessor, plays Ahmed the Thief, who takes what he wants. He’s set his eyes on the Princess (Julanne Johnston), but forgoes his initial plan of kidnapping her to keep her for himself… Good call, cause I understand that plan never wins hearts. He instead falls in love with her, and decides to pose as a suitor for her hand. He’s not the only one, there’s the Prince of Persia (Mathilde Comont), an Indian Prince (Noble Johnson) and the devious Mongol Prince (Sojin), who wants to seize control of Bagdad, and if he can’t win the Princess’ heart, he’s already sneaking troops inside the city walls. Ahmed, posing as a Prince wins the fair maiden’s heart, but comes clean with her about his true heritage, something one of her handmaidens (who serves the Mongol Prince) reveals it all to the court. Captured and beaten, Ahmed is dejected, and ejected from the palace. It’s a sweeping romantic adventure filled with opulent sets, the likes of which we really don’t see anymore. There are monsters, of air land and sea (including a chamber of sirens/mermaids, with fantastic jellyfish chandeliers), enchanted trees, magic carpets, crystal balls, cloaks of invisibility and winged horses. Fairbanks brings a youthful, boyish charm to his character, even when he’s being an out-and-out thief. He was an incredibly acrobatic actor and leaps about the screen, escaping villains eluding capture, and just making everything seem so easy. The sets designed by William Cameron Menzies, are fantastic, huge rooms and backdrops, filled with people, paintings, set pieces, it’s filmmaking on a scale that feels long gone. 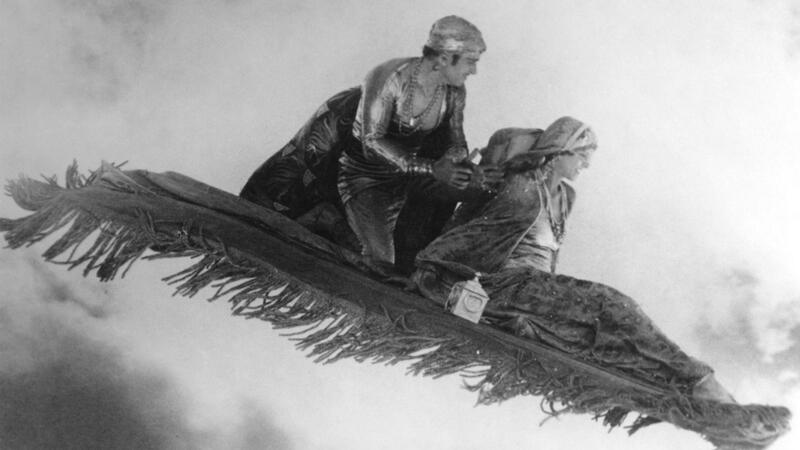 The special effects and creature designs are basic, though the special effects have aged better by comparison, allowing for both the winged horse and the flying carpet to leave their earthly confines and zip about the air. One visual gag that I just was stunned by, because it looked so authentic features a sequence with an ape. The ape is one of the animals, including a pair of tigers, used to guard Bagdad Palace. In shots that required the ape’s guards, they used children to make the animal look larger than it was (a trick later used by Ridley Scott to great effect in the original Alien). My brain didn’t even come up with that answer, I just saw the animal, and thought, that is one huge ape, where did they find it? Camera trickery at its best. Watching it with the eyes of the modern viewer, the film could be more tightly edited and paced, but Fairbanks seems to be having such a good time (appropriately over-reacting for his audience) that he you end up being completely engaged in the film.